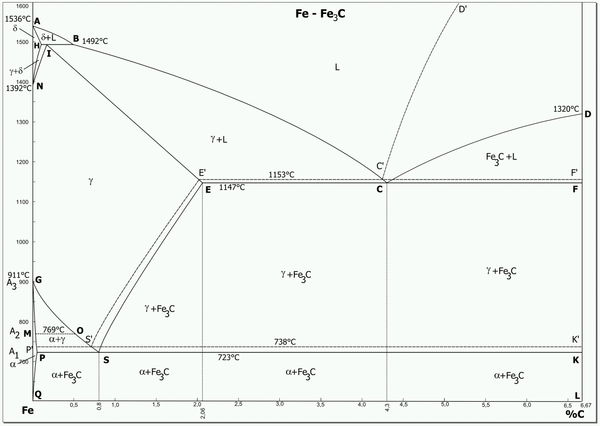 Phase diagram for the binary system iron-carbon (Fe-C). The phase composition depending on the temperature and the carbon content can be read off this dual diagram in which the stable system iron-graphite (dotted lines) and the meta-stable system iron-carbide (solid lines) are shown together, (Figure 1). The closeness of the equilibrium lines which correspond to one another indicates that the difference in the stability of carbide and graphite in the alloys is not large. Therefore, the carbon may be dissolved in the iron after solidification or, however, may precipitate in the form of graphite. 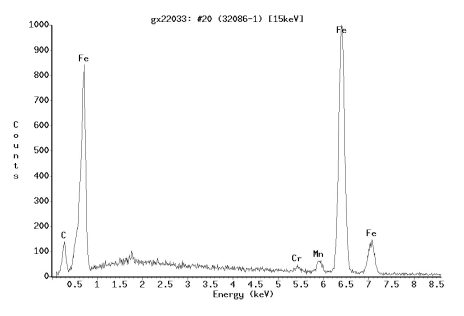 Furthermore, it can also occur in the structure in a bound form as iron carbide (Fe3C) and is dissolved in the α and γ solid solution in both systems. 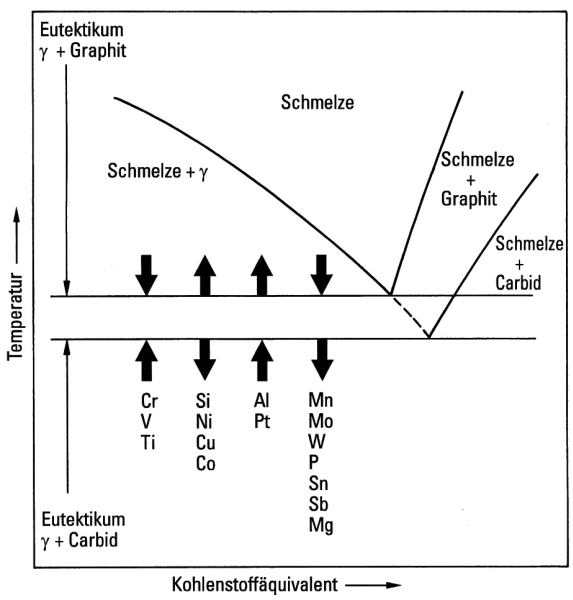 The eutectic temperature of the iron-graphite reaction is considerably higher than that of the iron-cementite reaction (Figure 2).In the case of slower cooling, mainly graphite forms, in the case of accelerated heat dissipation, on the other hand, mainly cementite. During annealing, graphite may form, reducing the cementite content. The tendency for graphite to form from cementite shows that iron or iron-rich solid solutions only form a stable equilibrium with free carbon (graphite). In the case of pure iron, more transformations take place during the heating and cooling in the solid state. It has become standard practice to label the which correspond to the transformations with A and to distinguish between them with numbers (s. A1, A2, A3, A4). The cubic face-centered γ lattice can be described as a close sphere packing, the body-centered lattice of the δ and α iron is less closely packed (s. Delta iron). Accordingly, the volume of iron becomes smaller in the transformation α → γ, i.e. during heating at the A3 point; however, it increases again dramatically in the transformation γ → δ, i.e. during heating at the A4 point.The solvating power of iron for carbon depends on the type of lattice and the temperature. 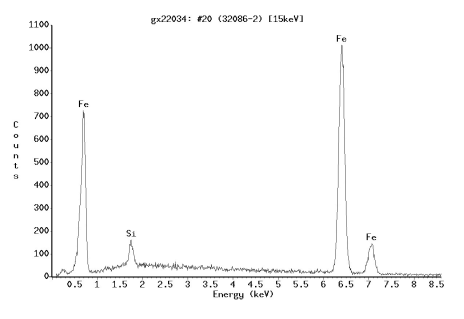 The face-centered γ iron has a must higher solvating power than the body-centered α iron. Iron carbide (cementite, Fe3C) is unstable at all temperatures. 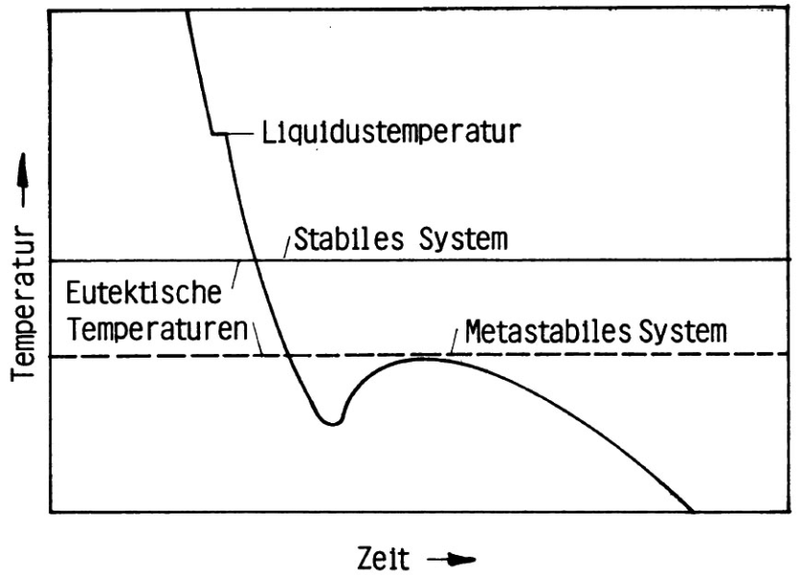 Depending on the temperature, annealing can cause a disintegration of its austenite or ferrite, on the one hand, and graphite, on the other (austenite = γ solid solution; ferrite = α solid solution). This is the basis for the production of blackheart malleable cast iron and the softening and ferritizing annealing. The cementite is extraordinarily resistant at room temperature. The eutectic temperature of the meta-stable system is 1147°C and the eutectic composition is 4.26% C or 64% Fe3C. This eutectic is also known as ledeburite; it consists of a set mixture of cementite and austenite (Figure 3). 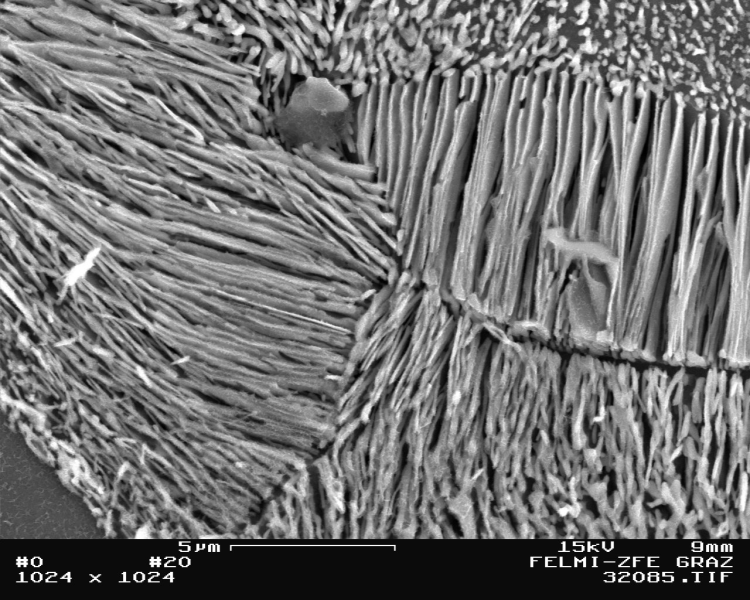 During further cooling, the austenite precipitates out of the then secondary cementite which accumulates on the cementite which is already present and which can hardly be distinguished in the micrograph. The eutectoid transformation of the austenite into pearlite happens at 723°C. Consequently, the pearlite is made of α solid solution (ferrite) and cementite (Figures 4 to 7). All of the carbon is precipitated as graphite during solidification, whereby the eutectic is called graphite eutectic here. 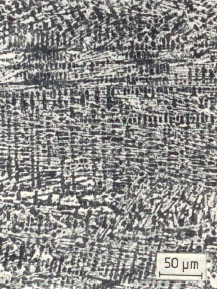 During further cooling, the secondary graphite precipitates out of the austenite which accumulates on the graphite lamellae and which cannot be distinguished. The austenite also undergoes eutectoid decomposition here, specifically into ferrite and graphite. In ferritic cast iron, the structure consists of a purely ferritic metal matrix with graphite embedded in it. Generally, a gray solidification of cast ion can be forced according to the stable system. A eutectoid transformation into purely ferrite and graphite, on the other hand, is more difficult, as with progressive cooling, the inertia of the graphite crystallization increases considerably. Therefore, the eutectoid decomposition of the austenite rapidly changes in the meta-stable system, whereby pearlite is formed which is then reflected in a pearlitic metal matrix with flake graphite surrounded by ferrite borders. Pearlite-stabilizing additives in cast iron enable the achievement of a purely pearlitic structure (s. Ferritic cast iron, Ferrite border). The above described transformations of the austenite under equilibrium conditions only occur during slow cooling. By increasing the cooling rate, the transformations are deferred to lower temperatures. Due to under-cooling, they then often occur in temperature ranges in which the diffusion processes required to create the equilibrium can only happen incompletely or not at all. The transformation then occurs via meta-stable intermediate states, i.e. states which do not correspond to the equilibrium and which only have a more or less large stability at low temperatures. At the same time, very substantial changes occur in the process of the transformation and in the formation of the structure which forms. With an increasing cooling rate, the melt is more and more under-cooled and when a certain critical cooling rate is exceeded, the stable system changes into the meta-stable system and chill occurs in cast iron (Figures 8 and 9). 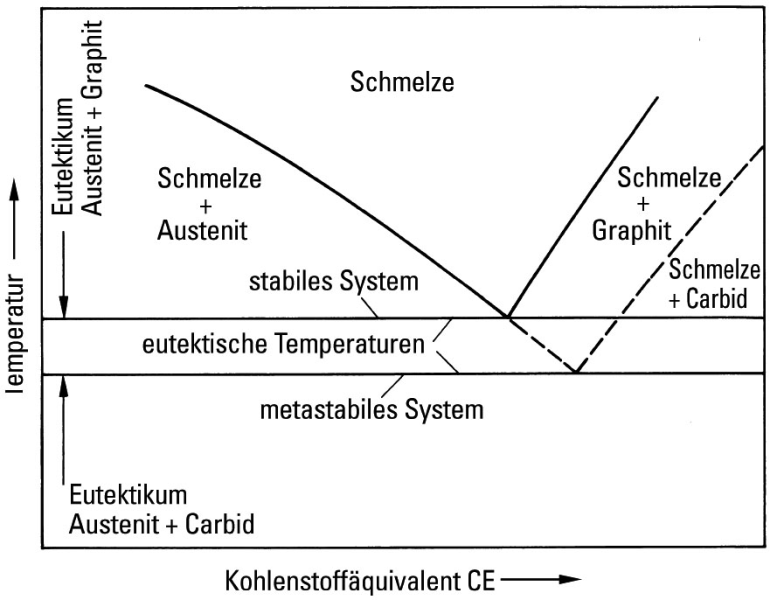 The eutecticsolidification of a cast iron melt and the austenitic transformation represent a separation of a homogeneous phase into two phases: into austenite + graphite or cementite. The chill begins at the moment when, in a temperature range, the crystallization speed of the austenite-graphite eutectic is low than that of the austenite-cementiteeutectic. The chill can be prevented principally by the targeted addition of nuclei for the graphite, particularly by the addition of silicon (s. Inoculation). The presence of silicon means that the solidification favors the stable system (austenite/graphite) because the equilibrium temperature for the meta-stable system is reduced. 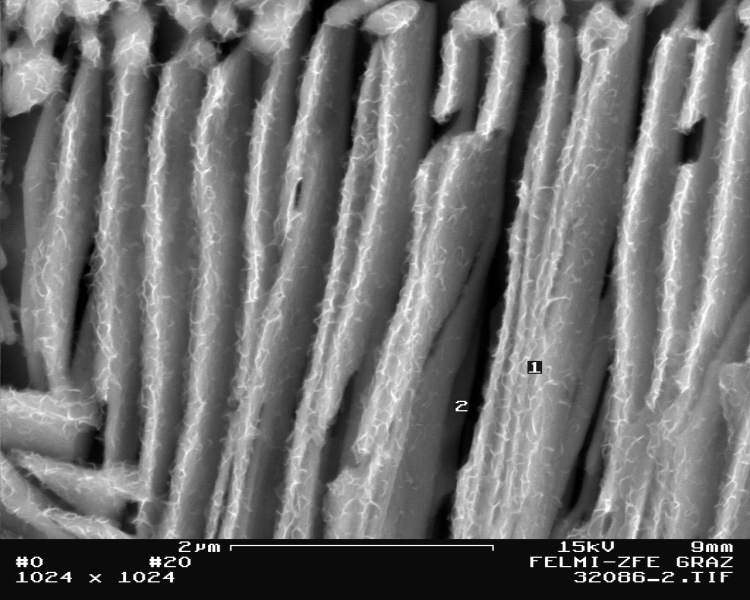 The gray solidification according to the stable system can be encouraged by slow cooling and by additives in the cast iron melt which have a graphitizing effect which increase the temperature range between the stable and meta-stable eutecticsolidification and reduce the carbon solubility (silicon Si, aluminum Al, copper Cu, nickel Ni). Carbide-forming elements such as manganese Mn, chromium Cr, molybdenum Mo, tungsten W, tantalum Ta, vanadium V and niobiumNb, on the other hand, increase the solubility of the carbon and increase the tendency to chill, whereby, at the same time, the number of eutectic grains decreases (s. Eutectic grain, Eutectic grain count). In addition, however, there are also melt additives which have a graphitzing effect during solidification but have the opposite effect during austenitic transformation, i.e. pearlitizing, such as copper and nickel (Figure 10). For the given casting wall thickness (constant cooling rate), by choosing a suitable composition and melt treatment, a chilled, mottled or gray cast iron with a ferritic or pearlitic metal matrix can be obtained (s. Metal matrix of cast iron). 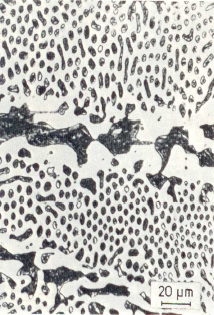 The solidification process of cast iron is also dependent on the number of nuclei in the melt and the growth rate of the eutectic grains (s. Balance of nuclei).